Quick compositional doodles depicting versions of light, shadows and animals. 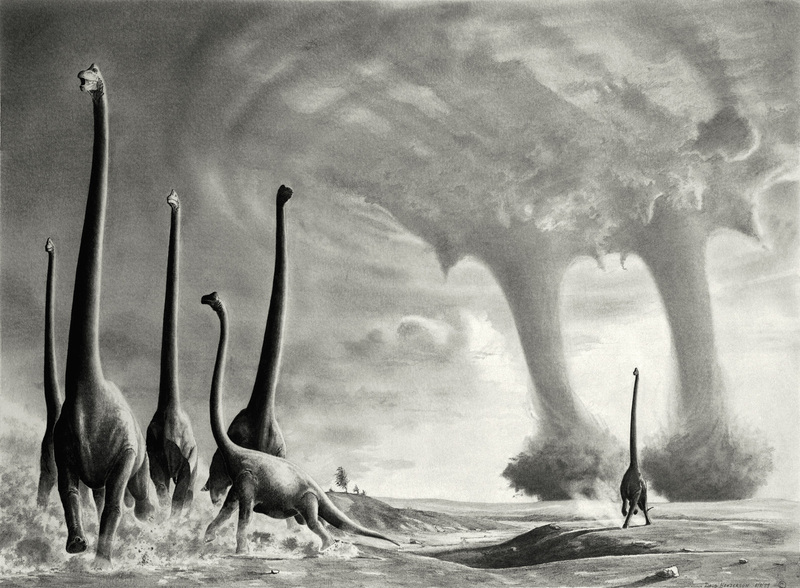 A group of Brachiosaurs flee before a tornado, an early finished graphite drawing. 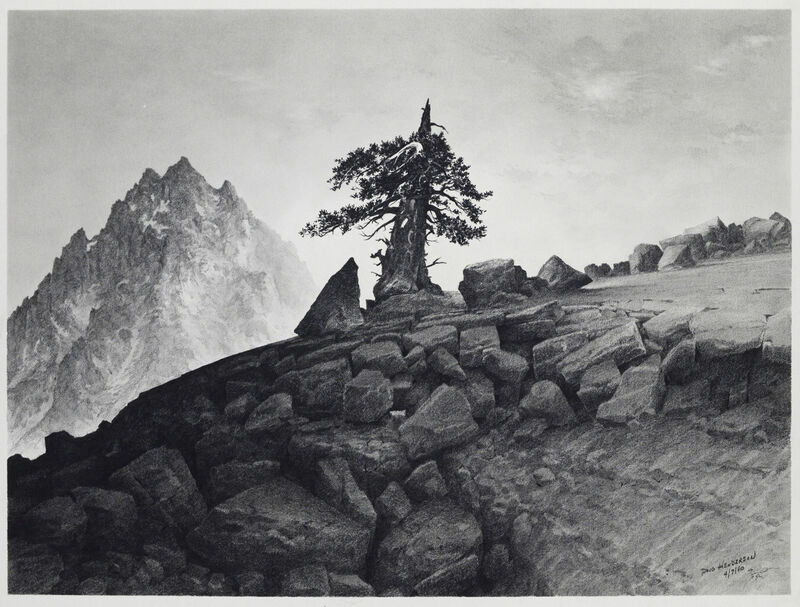 Pencil on 90lb watercolor paper, 14.5 x 18.5 inches, 1979. 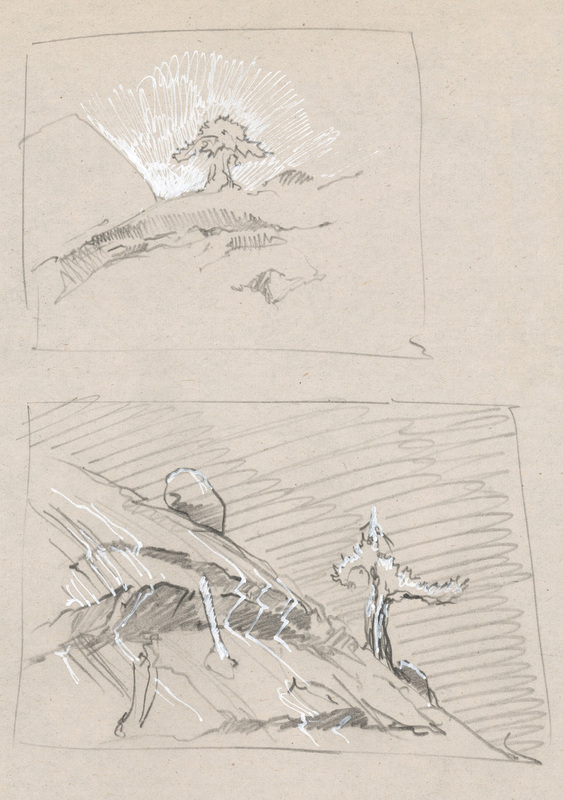 Compositional doodles of juniper on exfoliating granite of the Sierra Nevada. A juniper growing on exfoliating granite, an imaginary landscape. Pencil and graphite dust on commercial printing paper, 15 x 20 inches, 1980. Four compositional designs for a book cover. Pencil on bond paper, 8 x 10.5 inches each, 2009. 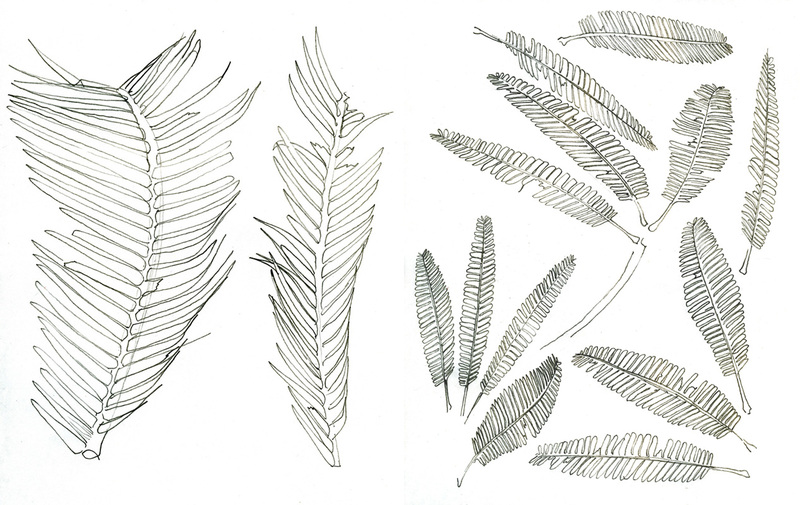 Outline components of Triassic Pterophylum and cycad leaves for a book jacket illustrations. Photocopies of pencil on paper, 2006. 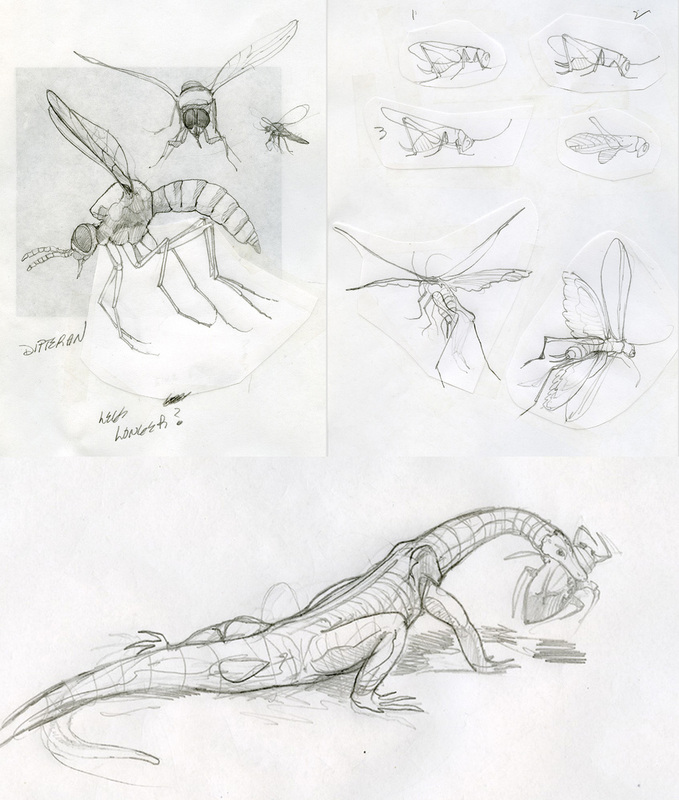 Flies, grasshopper-like and the small Triassic reptile Tanytrachelos with a waterbug, components for an illustration outline. 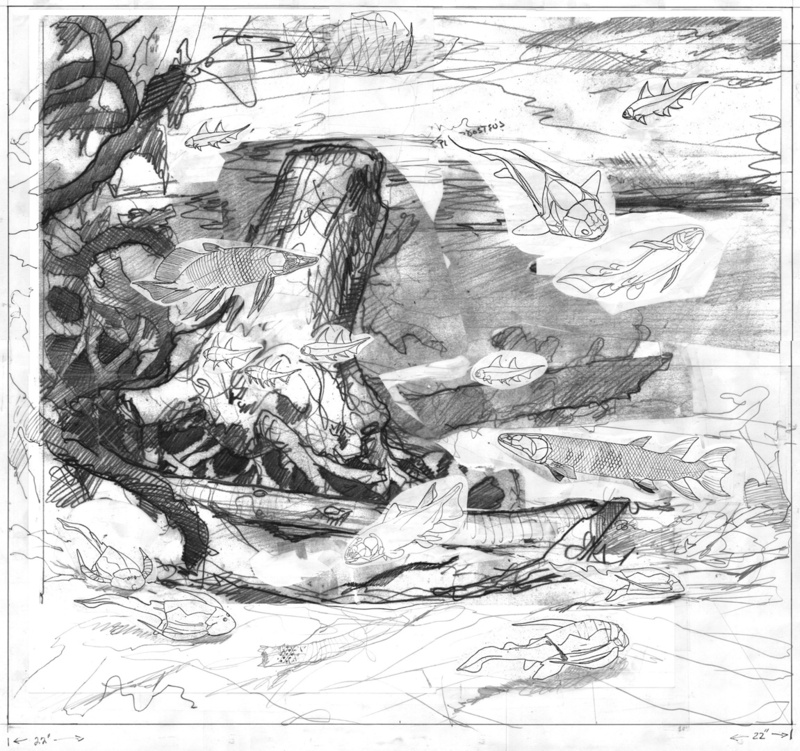 Pencil on paper, various sizes, 2006. Completed outline with integrated components, showing signs of repeated modifications. Pencil and photocopy collage, 16 x 22 inches, 2009. 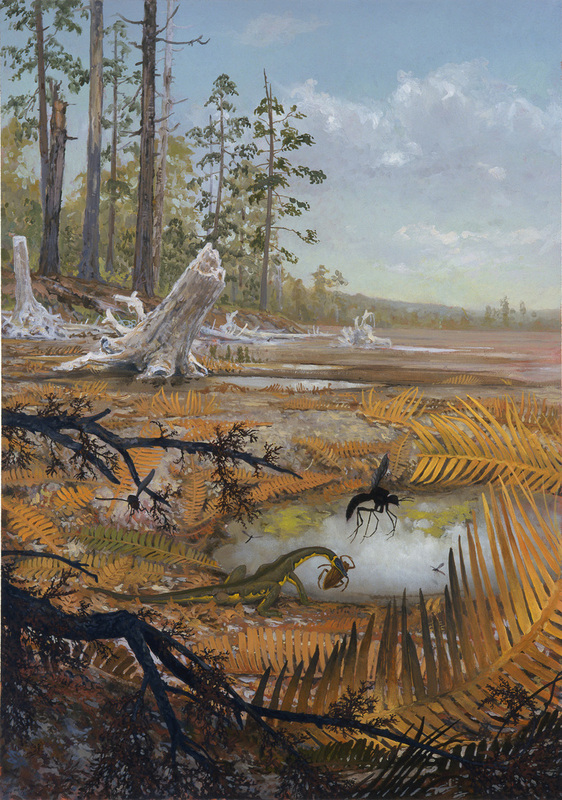 Completed illustration of Tanytrachelos beside a vernal pool with a small selection of insects in Triassic Virginia. Note some of the insects from the outline didn't make it through the messy progression to a finished work. Oil on sealed 140lb watercolor paper, 16 x 23 inches, 2009. 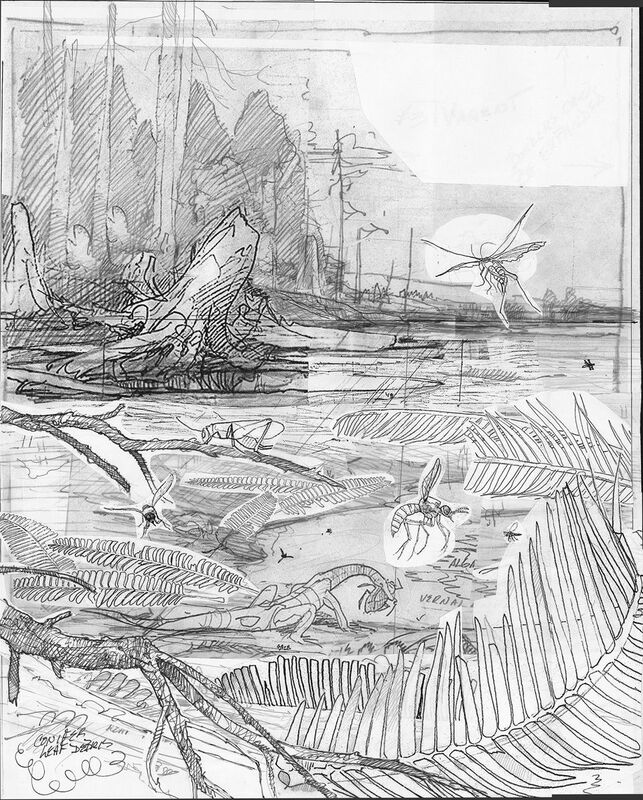 Two design drawings for an illustration of Devonian fish in a freshwater lake. Pencil on bond paper, approx. 8 x 8 inches each, 2004. The selected image design with a few refined components. 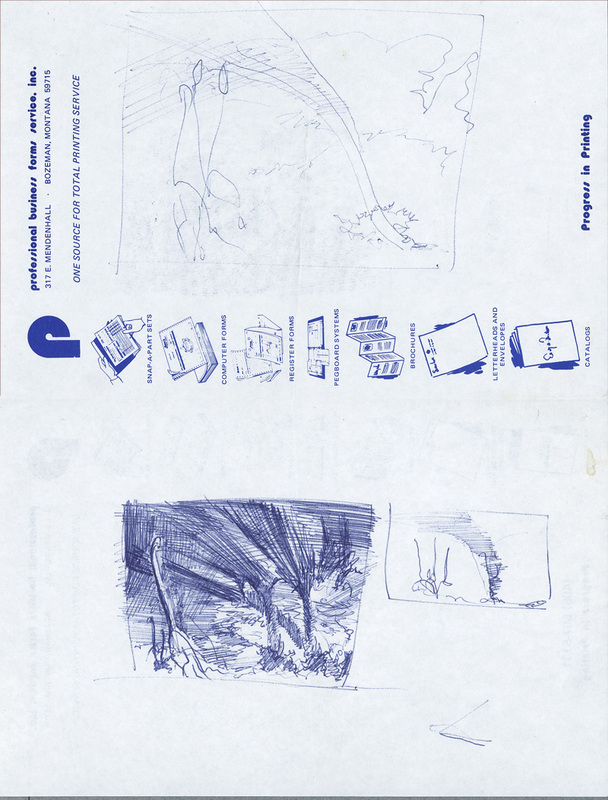 Pencil on bond paper, various sizes, 2004. The illustration outline with components in their final positions. Pencil, photocopy and injet component collage on bond paper, 20.125 x 22.25 inches, 2004. 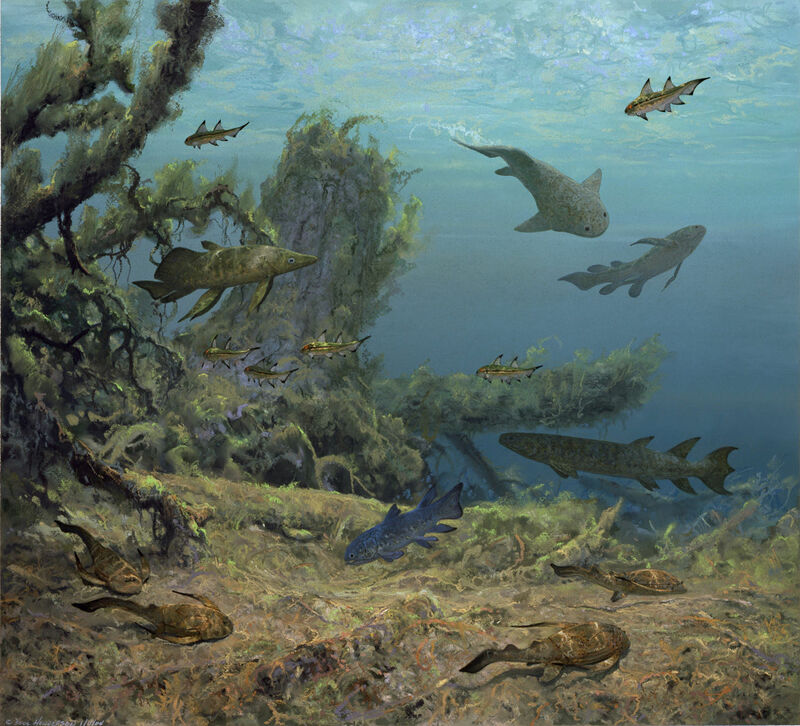 Finished illustration of fish in a Devonian freshwater lake in New York. Pastel on 140lb watercolor paper, 20.125 x 22.25 inches, 2004. 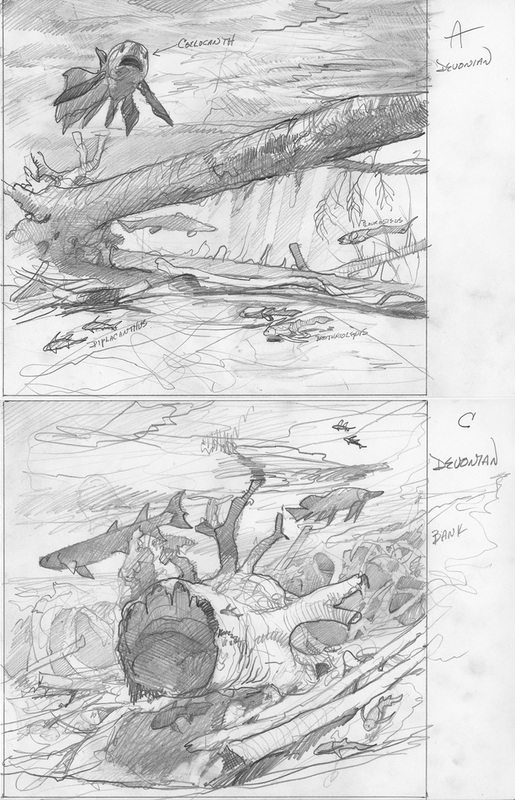 Two compositional designs for an illustration of Smilodon bringing down a Camelops. Pencil, inkjet collage and photocopy, 8.5 x 11 each, 2005. The sabertooth cat Smilodon brings down a Camelops in Pleistocene California. Pencil and white ink on toned paper, 10.25 x 13 inches, 2005. 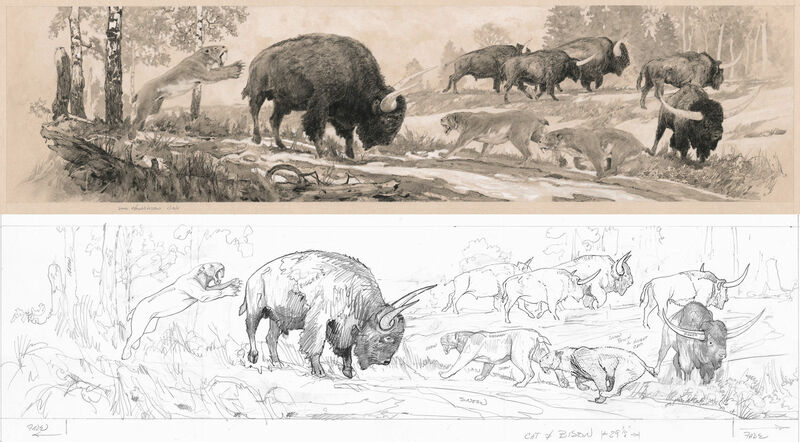 A completed drawing of sabertooth cats preying on a super bison in Pleistocene Utah and its outline design. 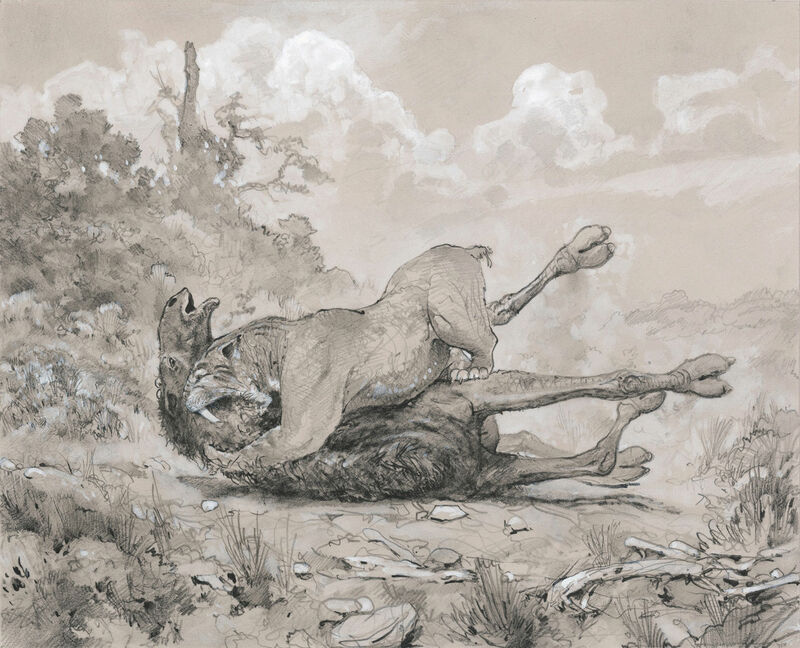 Pencil and white ink on toned paper, 7.25 x 29.125 inches, 2011. 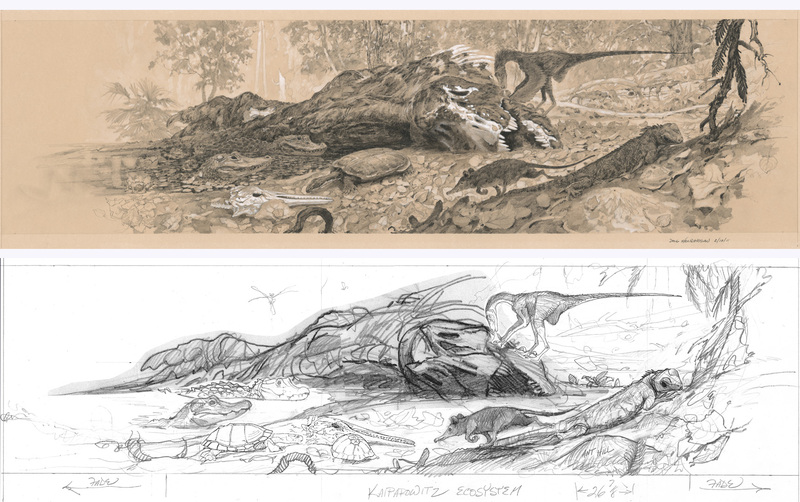 Comissioned by the Natural History Museum of Utah. A menagerie of plants and animals of the late Cretaceous Kaiparowits Formation of Utah with its slightly different design outline. Pencil and white ink on toned paper, approx. 7.25 x 29 inches, 2011. Commisioned by the Natural History Museum of Utah. Outline: pencil, inkjet and photocopy component collage on bond paper, 2010. 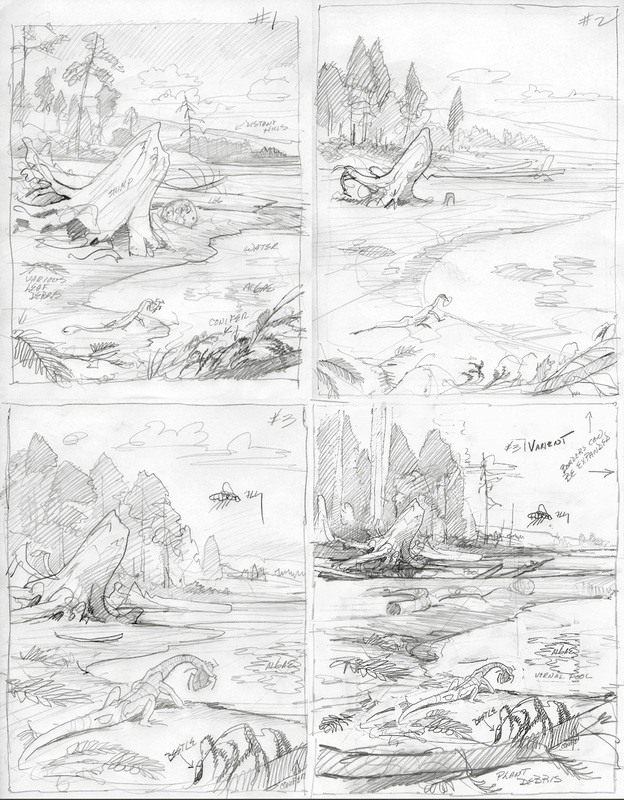 Outline design for a Carboniferous scene representing the Joggins Cliffs of Nova Scotia. Pencil, photoshop and inkjet component collage on paper, approx. 14.5 x 26 inches, 2006. Comissioned for the Joggins Fossil Centre. 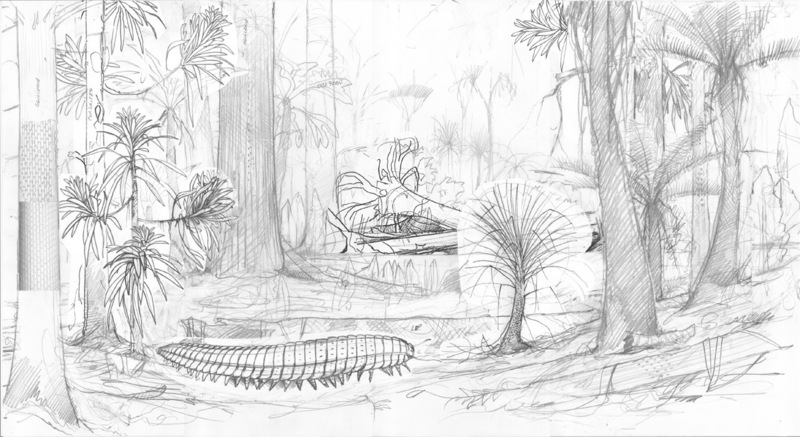 Outline design for a tentative second Carboniferous scene representing the Joggins Cliffs of Nova Scotia. Elements from both outlines were incorporated into the finished illustration. 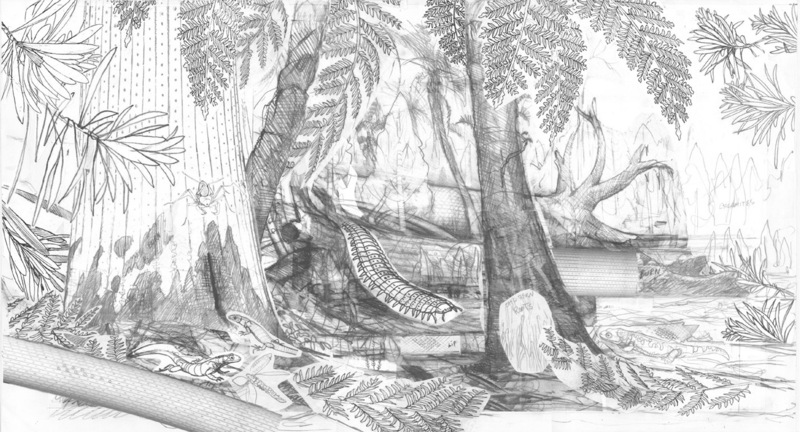 Reconstruction of a coal-age, Carboniferous forest from the Joggins Fossil Cliffs of Nova Scotia. The image depicts the hollow, fire-scared trunks of various species of the lycopod tree Sigillaria and a large seed fern stem growing on an elevated river levee on the edge of a flooded marsh. The larger trunk on the left is being used as a shelter by the small reptile Hylonomus. The large millipede Arthropleura emerges from a cluster of tree ferns. The forest floor is littered with seed fern and tree fern fronds, the strap-like leaves of Cordates, small Sigillaria limbs and shed Sigillaria leaves. Small lycopods and sphenophyllum grow up through the leaf litter. 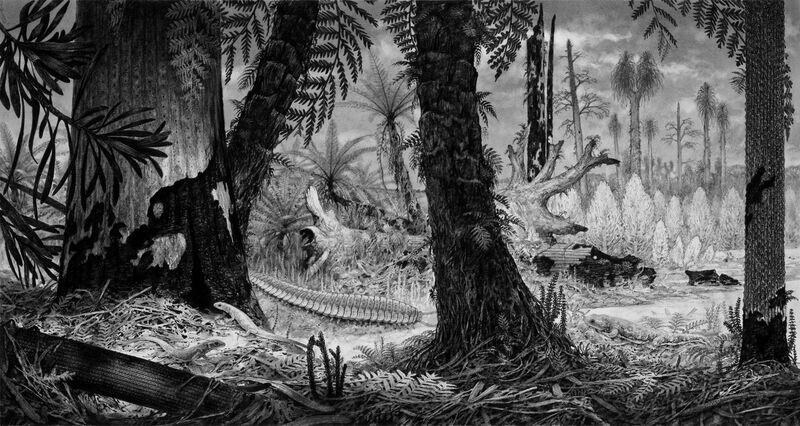 The predatory amphibian Dendrerpeton baskes at the water's edger, while thick stands of the horsetail Calamites march off across the open swamp of Sigillaria and Lepidodendron trees. Pencil and graphite dust on 2-ply bristol, 14.25 x 27 inches, 2007. Commissioned for the Joggins Fossil Centre. Various examples of a progression from simple designs, refined elements and orchestrated outlines leading to finished work.